There have been a number of updates recently from City Rail Link Limited (CRLL) showing some of great progress of the city’s highest priority transport project. 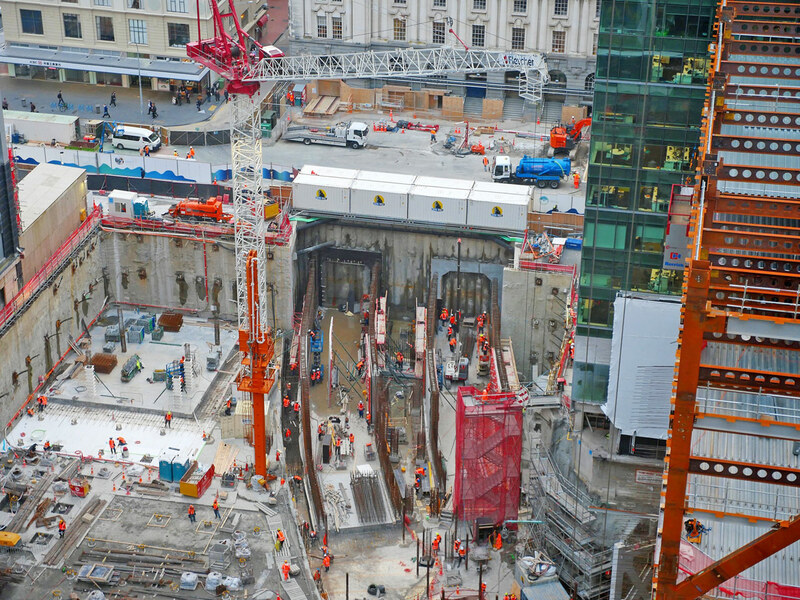 Outside Britomart, the path of the tunnels through the Commercial Bay development has become increasingly visible with walls starting to be formed. And here’s a closer look at it. Further along, work is progressing on digging out the trench under Albert St. It is now about 9m deep, about halfway to where it needs to be. This does once again make me wonder if we couldn’t use all that space under Albert St better instead of just filling it all back in again over the top of the train tunnels. For example, how about some Dutch style bike parking? Another option, they have to move the bluestone wall on Albert St by Durham Lane as part of the works. How about use that as an entry to the parking mentioned above and/or as another entrance to the Aotea Station, which could save some people heading north of Victoria St from having to cross Victoria St.
I’m sure there are plenty of other ideas for what could be done with that space if they weren’t planning to fill it with dirt again. The idea of doing something constructive with the space above the tunnel is great. But also so unlike anything NZ infrastructure projects would ever do. Even leaving it empty for now, with future use to be determined would be fantastic. But I’ll not be holding my breath. Obviously people have their reasons for wanting LR on Queen St but would someone be able to give some pointers as to whether this would work? It can work but as commented below, the Aotea station is too tall to permit it. San Francisco is a great example. Cross section of Market street has BART (heavy rail) on lowest level, MUNI (light rail, with street running elsewhere in SF) on mid-level, and MUNI/heritage trams on surface level along with road traffic. Intensive use of the corridor. Underpass crossing albert street would work. In japan they use the space as underground shopping street that links to different stations and destinations. Or Houston CBD with their miles of underground pedestrian tunnels,shops. Houston has had a hard time on this blog however their underground CBD area is an amazing use of space for pedestrians. No apparent future proofing for a harbor crossing? 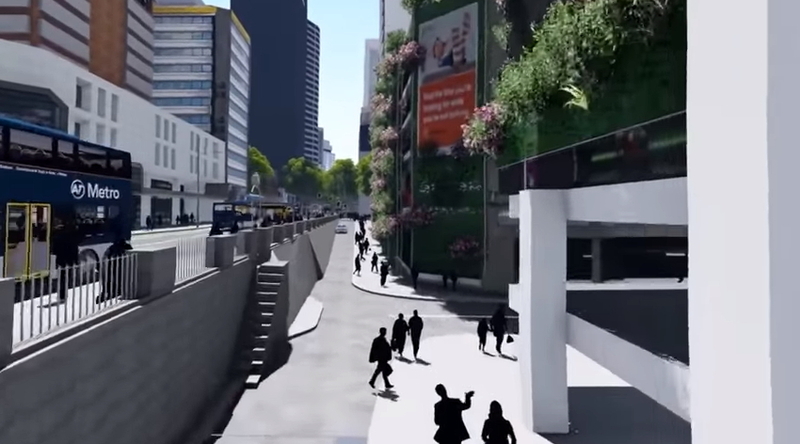 Or would that intersect with the tunnel on the Customs St, Albert st intersection? I also wonder whether there is enough to put the buses in a tunnel and give more streetspace to cycles and peds. The problem with buses and cars in a tunnel is you need to surface them somehow and portals can be hideous. You’d also need extensive ventilation and safety systems. I realise that portals can be really unatrractive, but this particular tunnel would run from Wellsley to Customs, where the gradient could help to reduce the impact. 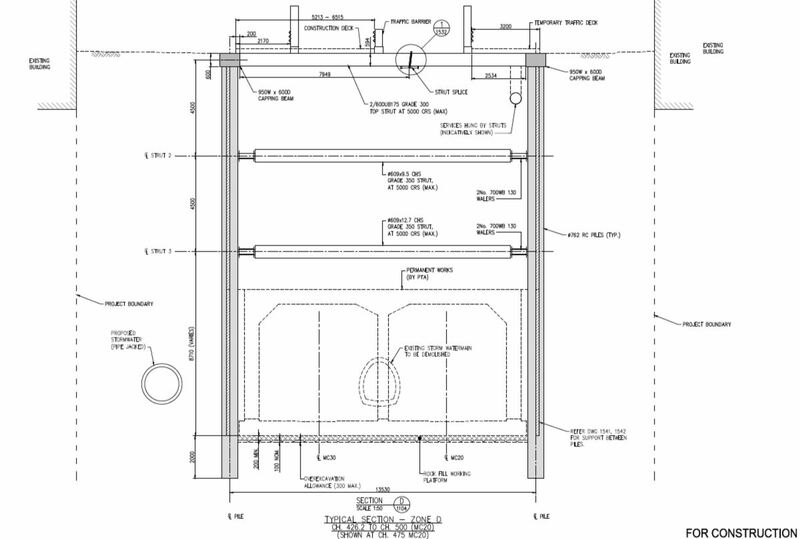 The Aotea station box goes right up to the underside of the road surface between Wellesly and Victoria so it could only be Vic to Customs which means the disbenefit of the portals and cost surely out weighs the benefit. Ah, I didn’t realise. I thought the station box only reached the surface just past Wellesley. Looks like a no go then…. It would be great to see an integrated CRL and LR station at Aotea where the just subsurface level of the station box was used as LR platforms plus a people circulation level. 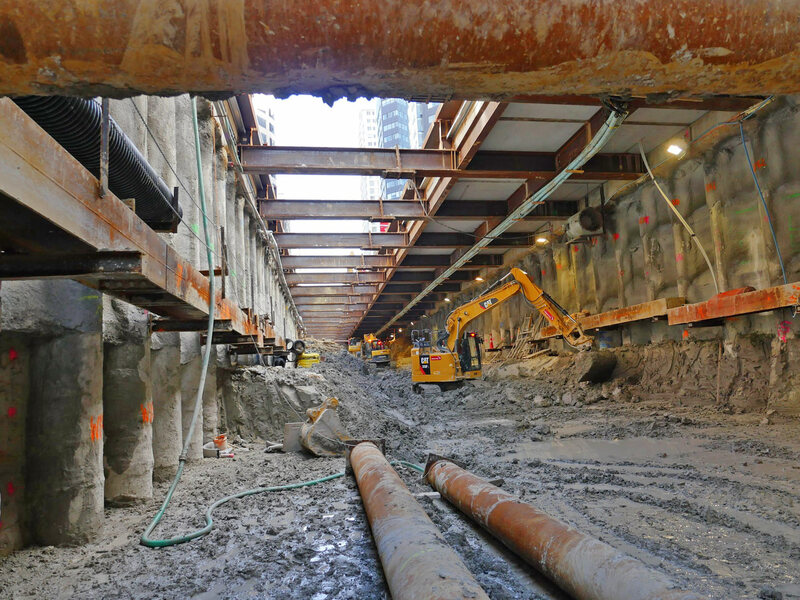 The LRT curving around Mayoral to dive under road level to the station then on to Customs through the Albert St tunnel. I can’t help wonder if they couldn’t have fit in a bus station or two in this project. An underground bus station on top of the tunnels in Albert St would certainly solve their problem of the horrible Sky City bus station. And that lovely old bluestone wall – they’re leaving it in place? Or taking apart and putting it back together again later? (Auckland has a bad history of taking old bluestone buildings apart and then “losing” them…). It could, if people were being very clever, make a wonderful new entry into an underground space. It’s always been one of the more interesting, if not awkward, spaces in Auckland. Time for Auckland Council to put their advanced thinking cap on…. Use the toilet entrance then. I find it strange that the toilets can just disappear but having a train station entrance would be anti heritage. Using the toilet entrance is exactly what I was thinking when writing the post. Might be a bit of a narrow entrance is the only major problem but then the more entrances that are added, the more it helps spread the load. Is silly for people wanting to go north to have to exit station, walk back up or down hill to Vic/Albert intersection, wait to cross then head up Albert St.
Or that a wall can be demolished, moved, rebuilt stone by stone, and then still claim it is untouchable Heritage. Some of these heritage people have their heads stuck firmly up their arses…..
Special Auckland ‘heritage’, aka façadism. 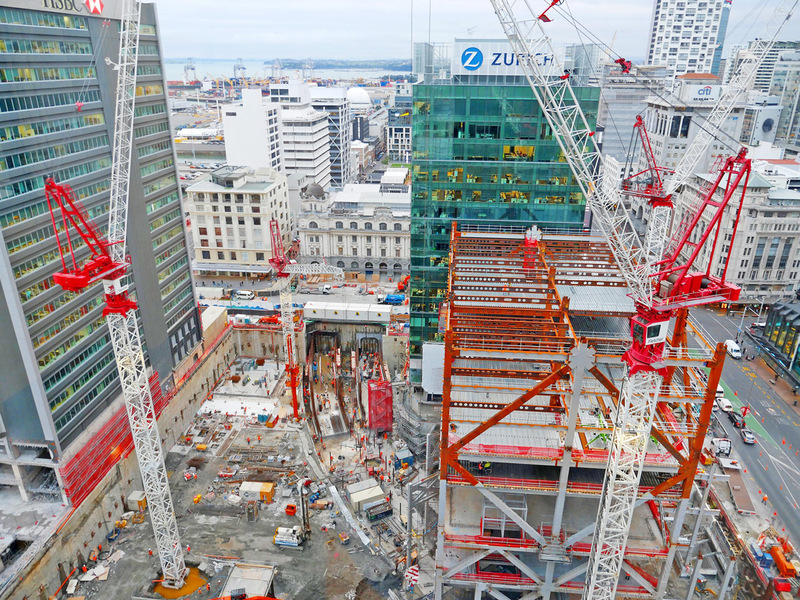 Been at it since they demolished Leonard Terry’s extraordinary 1867 BNZ in 1981 and they’re still at it. The space could be used for shops, supermarket, laundromat, bars, clubs, parking, warehousing/storage, pretty much anything that already exists in the CBD not requiring windows. I think the bike parking is a brilliant idea for this space. All that you’d need extra is the concrete floor and ceiling, lighting, bike racks, and a couple more of those stone archway doors like the ones already there (for H&S and more access to stop bottlenecks). I watched while the Quay St cycleway was being built. Construction workers removed sections of the heritage-protected Big Red Fence, did some concrete work, then put the fence back in a different spot. Does that change its heritage status? No – it helps cyclists while retaining its traditional look and feel. Exactly like this underground cycle park would. Good on you for asking, and looks like it should be followed up! Great to see the progress in such real concrete terms. Interesting ideas for the space above. +1 to not backfilling it and to utilising that space for something else. Buses, cycle lanes, bike park, shops (could be a street market). Even just leaving it empty for now would make more sense so the space could be used in future rather than having to re excavate it. Is that filled in space not going to serve some structural purpose? I would assume that if the gap was used for something then all the structures around the tunnels would need to be modified to accommodate that, with associated costs. Budapest has an impressive array of subterranean links, principally due to the cold that makes heating an underground passage far more logical than people freezing on the surface. While Tamaki Makaurau does not suffer from the biting cold of Europe, it does pass a reasonable season of rain and for the less thick skinned (myself amongst them), winter is cold enough. This would seem to be a fantastic opportunity to implement some underground life into the city (the Albert Park proposal is excellent also). Bike parking is a good idea, another link to Aotea station and Albert Street underpass also great. A pedestrian level following the subway would be splendid in the blustery months for the uptown / downtown shuffle. Completely off topic but does anyone know if the Newmarket Train Station was ever intended to be a Transport Hub? There is a big carpark next door that appears to be perfect for a bus terminal. I notice that New Lynn Transport Centre is extremely functional, and although the Onehunga terminals are not quite integrated, having a centre gives so much unity to public transport, something that Newmarket lacks. A bus to train transfer involves crossing at least one major intersection from most angles, making tight transfers difficult to achieve (I am an ambitious multi-modal transport user so often miss my connections). Excuse the digression.